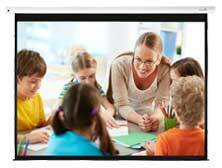 It's not just wireless presentation systems that have come on in leaps and bounds, a whole array of Audio options are now available to make the most of your presentation. Speaker options from soundbars to on-wall to in-ceiling offer you superb and discreet sound whilst AV Receivers allow you to connect multiple sources to them and switch between with a touch of a button. Ultra HD BluRay Players - New depth's of realism.